GOLD PRICES declined Monday ahead of new round of US-China trade talks, while a return of the US government shutdown loomed after talks over President Trump's border-wall with Mexico broke down in Washington, writes Atsuko Whitehouse at BullionVault. Spot gold prices lost 0.7% to trade at $1307 per ounce Monday lunchtime in London, slipping less for non-Dollar investors as the US currency rose on the FX market. The US Dollar Index (DXY) extended its run to six consecutive days of gains, standing near clinching fresh multi-week tops. 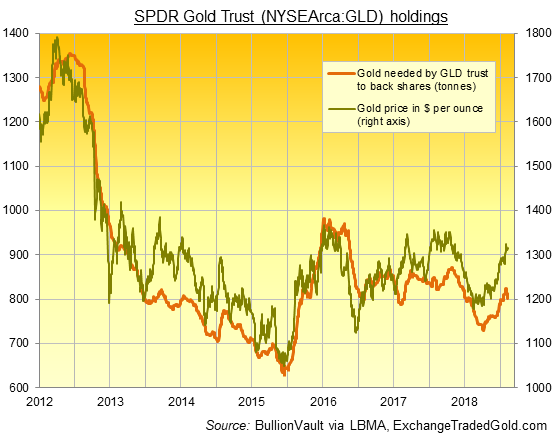 In contrast the world's largest gold-backed ETF product – the SPDR Gold Trust (NYSEArca:GLD) – has now seen outflows of investor cash for six straight sessions. Shrinking all through February so far, the GLD needs almost 22 tonnes fewer to back the value of its exchange-traded trust fund shares, reversing two-thirds of January's entire inflow – the strongest monthly rise since September 2017. "The market may have been quick to turn its back on the Dollar, but we are not for turning and we remain Dollar bullish," say analysts at Asian retail and London bullion bank HSBC, arguing for "safety" assets as the picture for global growth is softening. New data Monday said the UK – the world's 5th largest national economy – grew just 1.4% in 2018, its slowest since the global crash of 2009. With less than 7 weeks now remaining until Brexit, key numbers in today's release all pointed down year-on-year, including business investment, construction, manufacturing, and the UK's trade balance. "However, health sector, management consultants and I.T. all doing well," said the UK's official data agency. Talks today re-start in Beijing to try and find a new deal between Presidents Trump and Xi to avert a return of the US-China trade war, set to see huge tariffs imposed on each other's exports when the current "ceasefire" ends 1st March. Beijing's foreign ministry separately demanded today that the US " immediately stop its provocative actions" after the two US guided-missile destroyers conducted what Washington called "freedom of navigation" exercises near islands claimed by China in the disputed South China Sea. Back in Washington, talks between congressional Republicans and Democrats aimed at averting another US government shutdown broke down again at the weekend over Trump's demand to fund a wall along the US border with Mexico. Current funding agreed for the Department of Homeland Security and other federal agencies expires this Friday. Over in Europe, gold prices for European investors slipped 0.6% from last Friday's new 22-month high at €1162 as shares across the single-currency zone rallied following smaller than expected action in France from gilets jaunes protesters in the weekend's Act 13 of demonstrations against President Macron. The UK gold price in Pounds per ounce held firmer at £1013 as Sterling extended its decline following Monday's weak GDP figures. To break the UK Parliament's deadlock over approving or rejecting the European Union's formal Brexit deal, Prime Minister Theresa May at the weekend accepted the offer of more talks with opposition leader Jeremy Corbyn. But "there is no hope of her agreeing" to the detail of Corbyn's requests, according to one Labour MP, with a senior member of May's Cabinet calling them "a dangerous delusion". You can receive your first gram of Gold free by opening an account with Bullion Vault : Click here. The London Gold Market Report is the daily market review from BullionVault, the world's largest physical gold and silver market for private investors. A full member of professional trade body the London Bullion Market Association, BullionVault publishes the LGMR every day that the market is open, bringing you insider comment and analysis from the very center of the world's $240 billion-a-day physical gold trade, and putting the latest gold price action into its wider financial and economic context. Please Note: This article is to inform your thinking, not lead it. Only you can decide the best place for your money, and any decision you make will put your money at risk. Information or data included here may have already been overtaken by events – and must be verified elsewhere – should you choose to act on it.